No doubt about it; satan is a defeated foe!! But that doesn’t stop him from trying to deceive you every way he can; and believe me, he tries every trick in the book….and even some that aren’t. What kind of tricks does he use since his visit to the “dentist?” He is, after all, a “toothless lion,” right? Even though it’s true he is completely bound, he isn’t gagged. From his mouth, he spews out “Water–words of condemnation–like a flood.” His head was crushed by Jesus so he no longer has any bite. All he can do is prowl around and roar…..and he’s really good at that. Strong, young, lions that contribute to the pride and do the hunting DO NOT ROAR. That would scare away their prey. They lie in wait, SILENTLY, and creep up on their prey until they’re close enough, then they attack and kill their prey with claws and teeth. 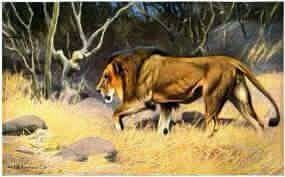 It is only the old, toothless, decrepit, and useless old lions who are no longer able to hunt for the pride are the ones that roar. They are longer able to hunt or do anything else, for that matter. All they do is sit around and nap all day. The reason they roar is SOUND threatening. That’s the devil right there. All he can do is SOUND threatening. 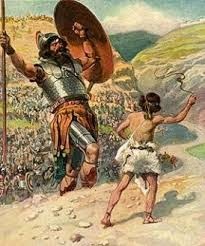 In the account of David and Goliath, there are a couple of clues to his tired ol’ tactics. Bear in mind you and I, Church, have NOTHING to fear from the devil. 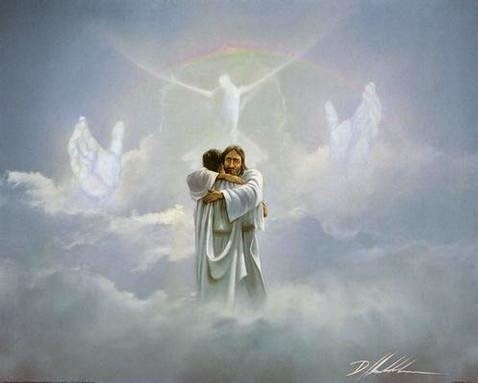 We have Jesus to deal with him for us! Unbelievers have NO DEFENSE against him. He can pluck their “number” out of the hat any time he pleases. They’re completely subject to his whim. According to Genesis 3, the devil was sentenced to eat “Dust,” for the rest of his days. The Bible has a lot to say about dust. The modern-day version of the Philistines, interestingly, live in the same geographical area: Gaza. They even call themselves “Palestinians.” That’s just too close to be coincidence, isn’t it? The Philistines are descended from a man named, “Casluhim.” Never name your sons this name, which in Hebrew means, “Fools.” The “im” on the end of the word makes it plural. “Casluhim” was one of the sons of Mizraim, from whom came the Egyptians. His father was, “Ham,” who’s father was Noah. (Genesis 10:14). The name Palestine/ Philistine seems to be related to the verb פלש (palash), denoting the expression of intense grief. The verb פלש (palash) indicates a rather hysterical action, induced by grief and involving dust or ashes to roll around in. That’s right, folks: The Philistines are fools that roll around in the dust. It is their descendants who have taken over the very similar name of their predecessors, calling themselves, “Palestinians.” These people are literally following in their footsteps. They are antagonistic to Israel, just like their foolish ancestors were. That didn’t end well for the Philistines. It won’t end well for the Palestinians, either. “Philistine,” simply put, is the spirit of condemnation; of feeling that you are “dusty or dirty.” The subject of dust is mentioned many times in the Bible. 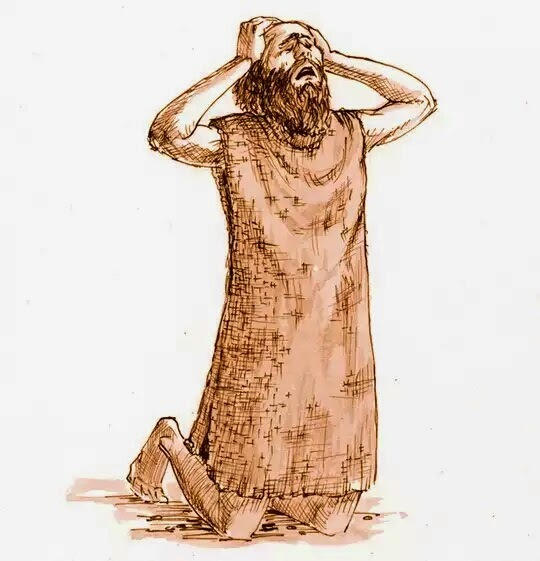 In the Old Testament, for instance, people put on sackcloth and dumped ashes and dust on their heads to express grief or guilt. Combine all of those pictures of dust together and you have a picture of guilt, grief and condemnation. The first mention of the word, “Dust,” in the Bible is when God made Man out of the “Dust of the earth.” He became MUCH MORE than dust when God breathed His very life into him! In so doing, man became a dignified being clothed with His honor and glory. When he fell, that is what left him: All the honor and glory. He was now ONLY dust, and cut off from God. THIS IS PRECISELY HOW CHRISTIANS CAN BECOME FOOD FOR THE DEVIL TO DEVOUR. Don’t allow him to make you feel dirty or dusty. Wash the dust off yourself. If your pastor doesn’t do it for you, you do it for yourself. Wash with the WATER OF THE WORD OF GOD–FREQUENTLY–and remind yourself that YOU ARE ALWAYS, AT ALL TIMES, THE RIGHTEOUSNESS OF GOD IN CHRIST. Whenever you hear such a message, whatever–or whoever–the source, I don’t care if they are a PhD, you are hearing the booming voice of Goliath in your ears–the roaring lion. He is trying to trick you into believing that you are dusty, dirty, that God is angry at you and that that He doesn’t love you. HE’S LYING. I say again: You are the righteousness of God in Christ because of the divine exchange. Don’t be a victim of DUST! Wash your feet and you’ll be UNdevourable!